Anyone hungry? 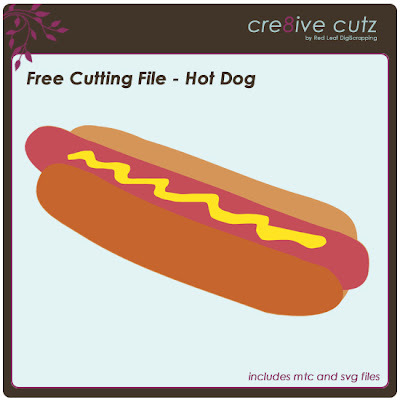 How about this cute hot dog for your food related scrapbook pages or projects? SVG and MTC files are included in the free download. Click on the preview to download the zip file, and don't forget to leave a little blog love if you like it! There is so much feminine stuff out there, I thought I'd do something a little more masculine for a free cutting file this time, so I put together this little screwdriver. 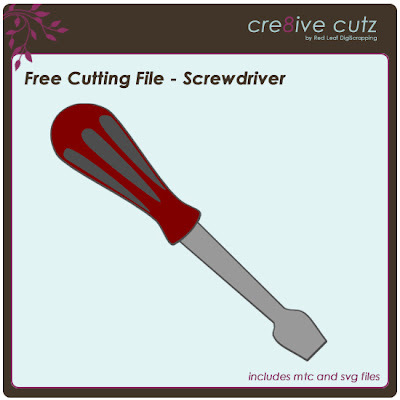 This file is now part of Tools of the Trade, available in the 99 Cent Store. Hope you like it! I've just uploaded a new free Make the Cut! 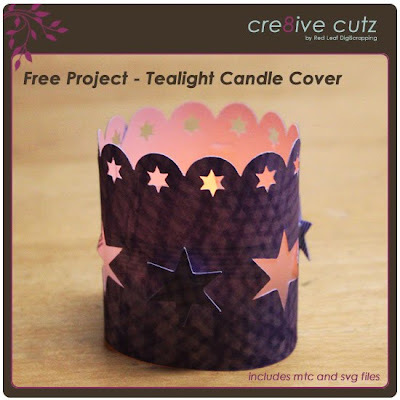 project to the Projects page, this cute little tealight candle cover. Change the paper it is cut from to make it suit any occasion. The free download includes SVG and MTC files. Video Tutorial - Resizing, Rotating and Skewing Shapes in Make the Cut! Here's another tutorial in the Make the Cut! Basics Tutorial Series. In this tutorial, you learn how to use the corner handles available on every shape in Make the Cut! to resize, rotate and skew your shapes. You also learn how to switch between the different types of handles. 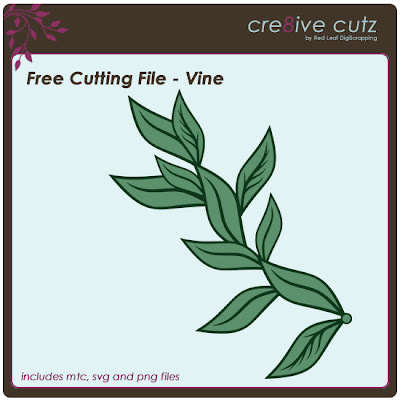 Here is a delicate little vine cutting file for your scrapbooking and cardmaking projects. The download includes MTC, SVG and PNG files. Click on the image to download the file, and don't forget to leave a comment if you like it! Over the next little while, I will be posting several videos in my Make the Cut! Basics Tutorial Series, all of which are designed to help someone brand new to Make the Cut! learn their way around the software. In this tutorial, learn how to use text and fonts to create your own word art. As well, learn how to bring True Type fonts you've downloaded from the internet into Make the Cut!. 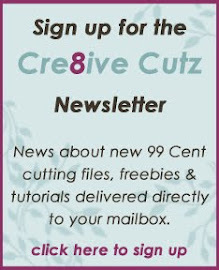 cre8ive cutz video tutorials now available through iTunes! I'm very excited to announce that cre8ive cutz video tutorials are now available on iTunes. Subscribe to our iTunes channel to watch the videos as soon as they are released. And if you like what you see, please leave a review on iTunes! Cutting True Type Fonts with your Cricut and Make the Cut! One of the great things about Make the Cut! is the ability to cut any True Type font you have on your computer. In addition to the fonts already on your computer, there are lots of websites where you can download free True Type fonts to use in your Cricut designs. Dingbat fonts, those fun little picture fonts, work the exact same way. Once you download a font, you can either install it on your computer by placing it in your Fonts folder, or you can create a separate folder just for your downloaded fonts. Keep in mind that the more fonts you install on your computer, the more you will slow your computer down as it must load all those fonts into memory each time you use a program like Make the Cut! which accesses the fonts. If you simply keep your downloaded fonts in a separate folder, you can still access them from Make the Cut!, but you don't have to worry about slowing your computer down. After you've found a few fun fonts to play with, it's time to start up Make the Cut! and see what you can create! I'll be posting a video tutorial in the next couple days showing you what you can do with True Type Fonts and Make the Cut! so stay tuned. 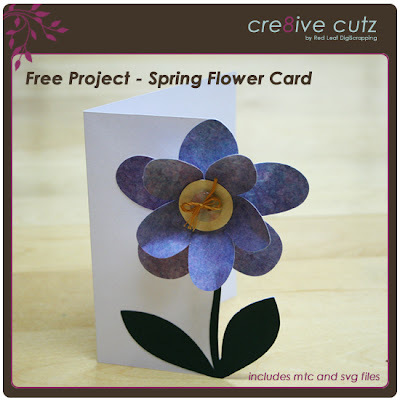 Visit the Projects page to download the free project file and create this pretty flower card, perfect for Mother's Day, spring birthdays or any other spring occasion. 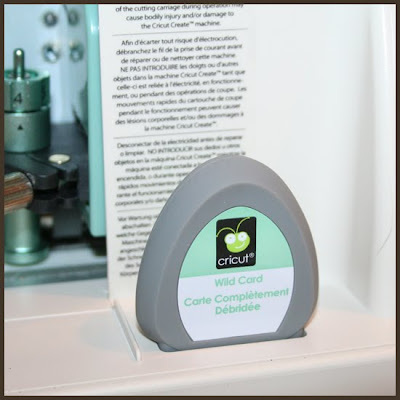 Check to ensure your Cricut is connected to your computer. See this post for instructions if you are not sure how to do that. Check to ensure your Cricut is turned on. Ensure your mat (including the paper you want to cut from) is correctly loaded into your Cricut. Check to ensure you have a cartridge inserted into the cartridge slot on your Cricut as shown below. Your Cricut will not be able to cut any Make the Cut! files without a cartridge inserted, it doesn't matter which cartridge you use. 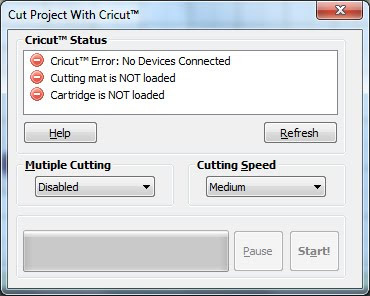 Click on the Start button and your Cricut will begin cutting your project. 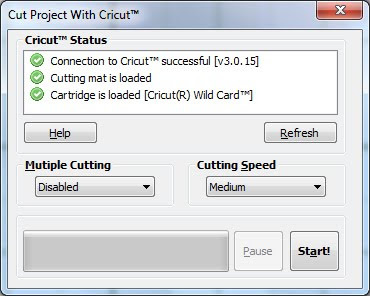 As it cuts, you will see the dialog box shown below, which tells you how much of your project has been cut, and approximately how much time is left until the project is finished cutting.